It is Good Friday, and once again I want to post pictures from the film The Robe on this site. 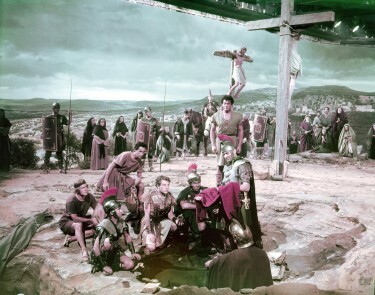 My father’s favourite actor in his favourite film – he was very moved by Victor Mature’s performance in this film particularly in the scene shown below. In a previous Post I did say that producers loved Victor Mature because all the films he appeared in made money – and here is a classic example. 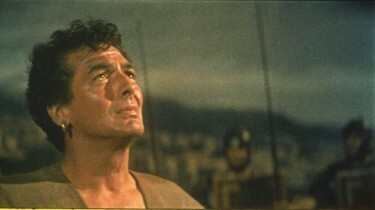 The Robe was the highest grossing film of 1953 – and the next one Demetrius and the Gladiators was 4th biggest of 1954. We must also remember that only a few years before in 1949 he had played Samson in Samson and Delilah which again was the biggest grossing film of that year. Also cast was Jay Robinson in his film debut as Caligula, stealing much of the proceedings from the films’s actual stars Richard Burton and Jean Simmons. Though his performance bordered dangerously on outrageous camp, his depraved Roman emperor nevertheless remains a most indelible image when reminded of the film.